If life is a dance, then this group — supported behind-the-scenes by Dana Levad — is moving to its melody. LITTLETON, Colo. — If life is a dance, then this group is moving to its melody. "When you're dancing, it's free," said Teri Wagner, founder of Spoke N Motion. "I feel like I'm flying when I'm dancing because it's so freeing and it just lets my spirit just soar." This group is a reminder it doesn't always take your feet, to dance with your heart. "If you have a heartbeat, you're a dancer, whether you're in a wheelchair or you're standing up," said Spoke N Motion dancer Don Gabenski. These are just some of the dancers of Spoke N Motion, a troupe made up of people with and without disabilities. At its core is dance mom, Dana Levad. "Oh, Dana is a saint," Wagner said. Levad is the behind-the-scenes support, helping the crew with everything from costume changes to weekly transportation to and from dance class and performances. "I know, without Dana, I probably wouldn't be able to do this," Gabenski said. Wagner said they've offered her gas money, but she says she wants to do it because she loves the company and what it stands for. "I really just help out where help is needed," Levad said. She does it all while helping her own daughter, Keslie, who was born with spastic quadriplegic cerebral palsy. 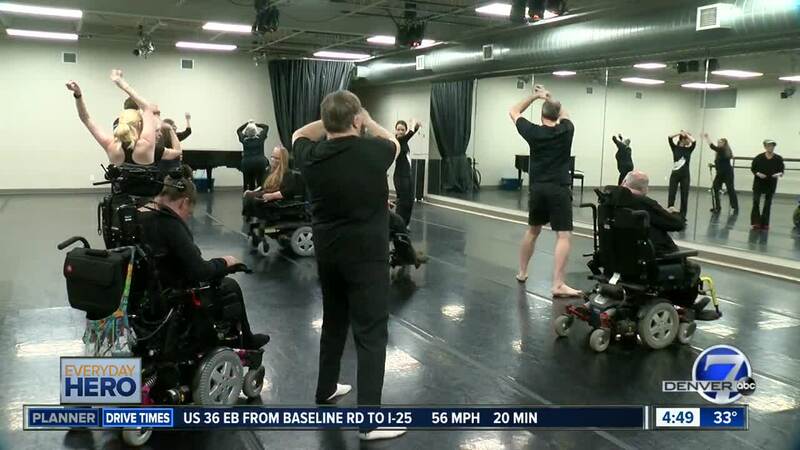 "When you have a child who has a disability, you kind of grieve a little bit and one of the things that I grieved is I didn't think she'd ever get to go to ballet class," Levad said. "And now, she does, and is not only getting to go, but is a great part of the whole troupe." The troupe is breaking stereotypes and reminds us it's really the rhythm of the heart that moves us all. Molly Hendrickson anchors Denver7 in the mornings from 4:30-7 a.m. She also features a different 7Everyday Hero each week on Denver7. Follow Molly on Facebook here and Twitter here . To nominate a hero in your life, click here . The 7Everyday Hero Award is presented to Coloradans who are making a difference in their community. 7Everyday Hero stories air on Sundays at 10 p.m., Monday mornings between 4:30 and 5 a.m. and again at 11 a.m. and Saturday mornings between 7 and 9 a.m.